How has the surface temperature of Earth been changing? DILBERT ©2013 Scott Adams. Used by permission of Universal Uclick. All rights reserved. This is the second installment of a series of articles giving examples of “green” initiatives that do little other than distract, along with ideas about what we should be doing instead. Trees are the lungs of our planet. Carbon dioxide levels rise and fall in an annual cycle, as plants convert carbon dioxide into oxygen. As forested land is depleted, our planet loses its natural ability to mitigate the damage that we are doing to the atmosphere. Accordingly, we should avoid cutting down trees whenever possible, but it should be done in a way that makes sense. Each summer I have to fill out numerous forms with the same information for my children’s camps, schools and afterschool programs, the PTO, etc. However, one of the schools has announced that it was “going green,” and would no longer be printing out the required forms. Instead, parents would have to go online to find them. I was delighted to hear this, and imagined that I would go online and see an online form which would be pre-populated with my data from last year which I could review, correct and then approve by clicking on a button. However, that is not exactly what the school had in mind. The forms were not to be submitted online, but instead needed to be printed out by the parents, completed by hand and mailed in. Somehow, parents print out their own forms does not strike me as any “greener” than the old system, where the school would print it out for us. The only difference is who pays for the copies. The story of “Offgreen” banking, and ideas on how to do better follow the jump. Similarly, some banks are trying to use a cloak of “greenness” to save themselves some money. As the ATM screenshot to the left shows, the bank is trying to guilt us into forgoing a 2-inch by 2-inch receipt. 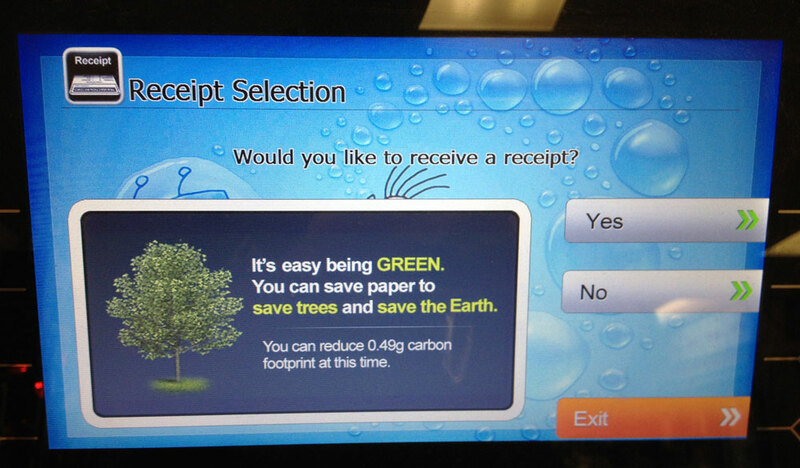 You can save paper to save trees and save the Earth. You can reduce 0.49g carbon footprint at this time. If I breathed even once during the time I read this message, I have exhaled 0.98g of carbon! Twice the potential savings for not having any record of my deposit. The electricity used by a 60 Watt light bulb gives rise to the production of 10 grams of carbon every second. That is the equivalent of 20 ATM receipts every second. My car discharges almost 20 pounds of carbon for every gallon of gasoline it burns. Each gallon of gasoline is the equivalent of over 18,000 ATM receipts. Instead of debating whether or not I should be printing a receipt, I should have debated whether or not to drive to the ATM in the first place! A round-trip ticket from Sydney to Australia for one person involves the emission of 2776 kilograms of carbon dioxide. This is the equivalent of more than five million ATM receipts! We need to focus our environmental efforts where they will be the most effective. When school and banks make these gestures in the name of “greenness” the results are either counter-productive or negligible. How can we keep our eye on the ball? Put clean used paper in a recycling bin instead of the trash. Reuse the back side of paper from the recycling bin when you need to make a sketch or jot a note. Take electronic notes instead of paper notes. Read articles and emails online instead of printing them out. Buy poly lumber furniture made out of quality artificial recycled post-consumer plastic and rubber. Not only you would be saving the trees and keeping soda bottles and automobile tires out of our ubiquitous landfills, but you would enjoy a quality material which is weather resistant, attractive and maintenance free.